Booking Activities 1.4 version was created to meet the needs of a new category of activity providers. You will now be able to offer activities while restricting their availability. For your organization, for logistical matters or some other reasons, it is sometimes better to close the bookings a few days before the event starts. For the same reasons, you may not want your customers to book an event too far in advance. Booking Activities now offers to set a booking period between X and Y days from today. All events before or after will no longer / not yet be bookable. You can set this period globally in the general settings of Booking Activities or by calendar. However, the opening and closing fixed dates of your schedules are still taken into account. The following features are all available for both activity AND group categories. It is now possible to limit the number of users per event. Thus, if you allow only one user (one order) per event, your event will be private. No other user will be able to book this event after you, even if places are still available. In addition, it will always be possible for the user to re-book his private event, in case a latecomer wants to join his group. 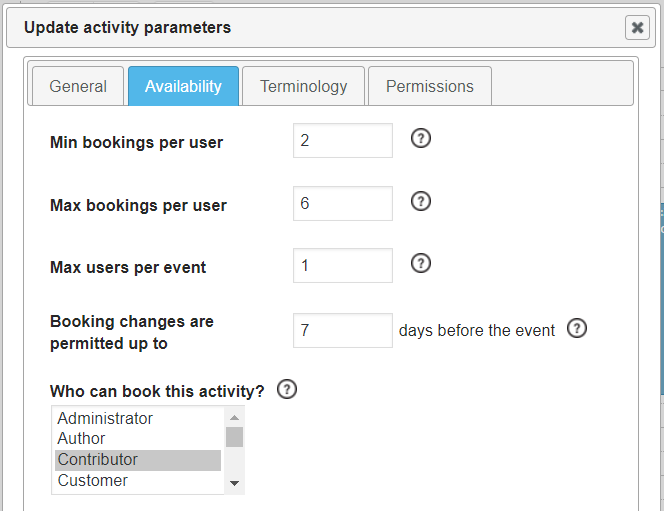 This feature allows you to ensure that each user reserves at least X places of your event, and at most Y places. Thus, if you offer courses, you can be sure that your participants are not booking their classes twice. Likewise, these parameters will be essential if you want your customers to come in groups of variable size while offering a price proportional to the number of participants. Used with the previous functionality, it will allow you to solve complex situations. For example, if for each event you have 3 guides (instructors, teachers, …) that can each accommodate 1 private group of 5 to 8 people, you just need to use this configuration: Min qty per user = 5, Max qty per user = 8, Max users per event = 3. Same as the previous feature, a user can complete his order later within the limit of the maximum number of reservations allowed. Restrict activities to certain user groups. 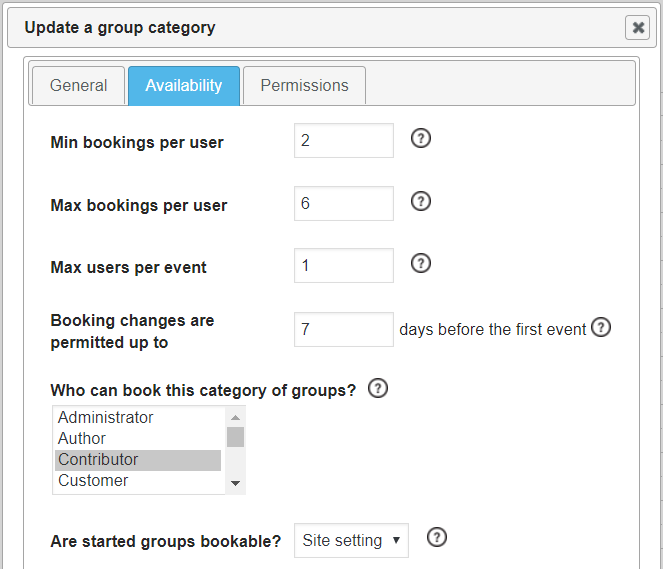 Only users with one of the authorized roles will be able to see and reserve the (group of) events in question. For example, you can offer activities or event bundles to your premium customers only. Until now, it was possible to set a common deadline for your entire site to cancel or reschedule a reserved event. For example, if you input “7”, your customers could change their bookings up to 7 days before the (group of) event or begins. Now, this limit can be set independently for each activity and group category. Indeed, all your activities are not equal, some are more engaging than others. You can even totally disable the ability to modify the reservation using a big enough number of days. A group of events can last several days. So far, as long as the last event of the group wasn’t passed, you could book the group. From now on, you can make groups of events impossible to book as soon as the first event has begun. This feature is available in global settings and for each group category. You are free to define which groups can be reserved even once started.